The Aesthetic Rejuvenation Center is pleased to announce we now have our own line of skin care products – personally selected by Dr. Freund and our other skin care professionals to provide the most effective products at great prices. 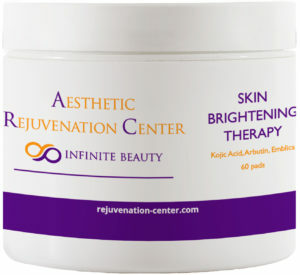 Our Skin Brightening Therapy is designed for all skin types. This fabulous skin care product comes in convenient, easy to “use and toss” pads which include a trans-dermal penetration system that allows the product to penetrate the upper layers of skin. Quality ingredients like Kojic Acid, Arbutin & Bearberry brighten & even skin tone; while antioxidants including Silymarin, Ascorbic Acid, Emblica, Curcumoids & Green Tea Polyphenols calm & sooth the skin & guard against free radicals. 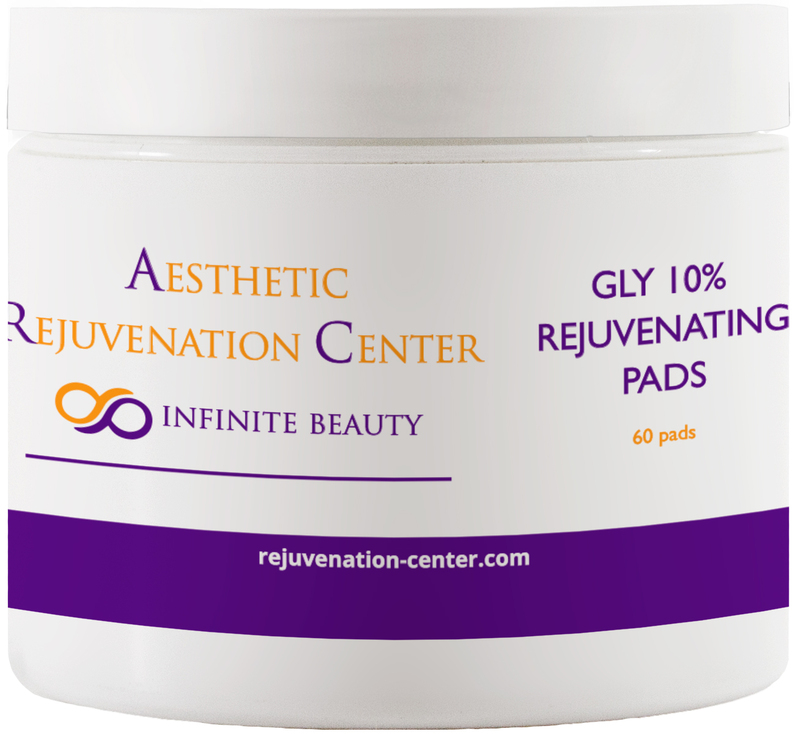 Our pharmaceutical grade 10% Glycolic Acid Rejuvenating skin care pads ensure minimal irritation and accelerate the removal of dead skin cells that can interfere with the proper oil drainage of the skin, removes surface oils, and unplugs pores. They also contain Witch Hazel which helps reduce surface oil and refines and reduces pore size. This product is free of gluten, paraben, oil sulfate, colorant & fragrance. They make an excellent and affordable solution for pediatric and adolescent patients and come in easy to “use and discard” pads. 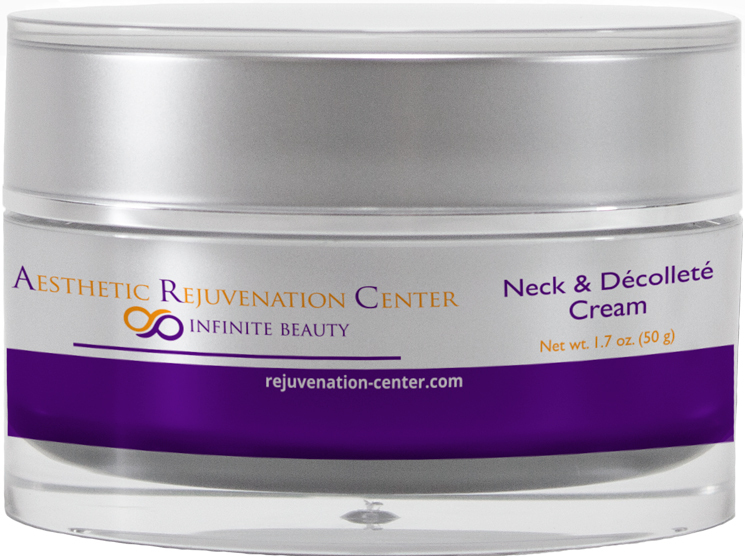 This revolutionary neck firming cream delivers the latest technology in skin tightening and sag reduction which helps to firm and rejuvenate skin that has lost definition with age. Biomimetic ceramide complex helps to repair the skin barrier and improves skin elasticity and texture. Peptides and botanical extracts support a more collagen rich appearance, leaving skin feeling smoother and tighter with less visible fine lines and wrinkles. Niacinamide assists in brightening areas of pigmentation and evening out skin texture and tone. Leontopodium Alpinum Callus Culture Extrace (a powerful antioxidant) helps life and tighten skin to address the appearance of sagging. Free from gluten, paraben, oils and fragrance; it is a great choice for all skin types. Our Ultra Lite Moisturizing Facial Cream is enriched with Vitamins A, C & E; Co-Q10, and green tea to help soothe and calm the skin. Squalane (a stabilized natural emollient found in healthy skin) and Glycerine help prevent against moisture loss. The product is gluten, oil & fragrance free and will not clog pores. It is ideal for the patient who is not overly dry but requires a light moisturizer and can even be used by acne patients with dry skin. Our Enriched Facial Cream/Night Cream contains a Biomimetic Ceramide Complex (Ceramide NP, Ceramide AP, Ceramide EOP, & Ceramide-2) which mimics the ceramides found naturally in skin to help prevent trans-epidermal water loss which will keep your skin hydrated. 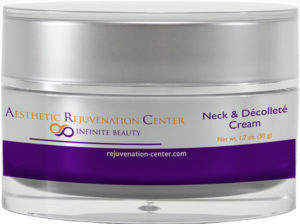 It also helps to repair the skin barrier; improving elasticity and texture. But that’s not all! 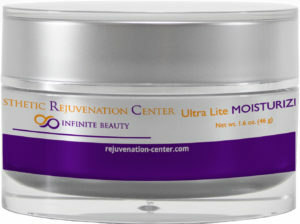 The product also contains Hyaluronic Acid which penetrates the skin to deeply moisturize and forms a protective barrier on the skin’s surface, locking moisture in; Tetrapeptide-21 which compliments the skin’s nightly renewal & metabolic functions and supports the skin matrix to target wrinkles; Niacinamide which supports health collagen production which improves the appearance of fine lines & wrinkles, helps fade discoloration, and promotes healthy skin texture & even tone. Green Tea Polyphenols, Resveratrol, Caffeine USP, and Vitamin E calm and sooth the skin while protecting from free radical damage. 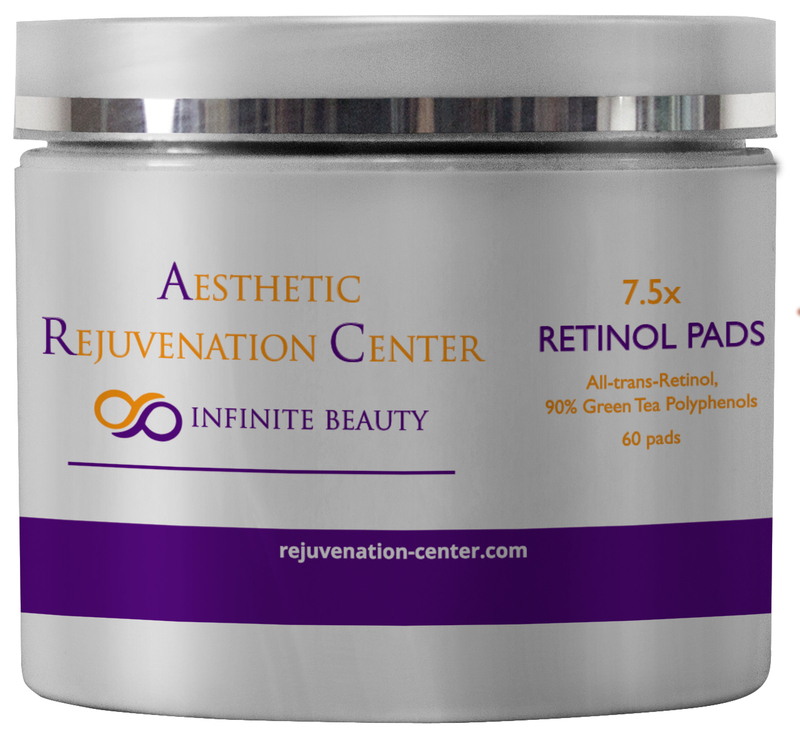 Another great product is our Retinol Plus Pads which are available in 2X, 5X, 7.5X and 10X concentrated levels of all-trans-Retinol which assists in the achievement of smoother, firmer and more evenly toned skin. The fast-penetrating delivery system rapidly boosts retinol levels deposited on the skin to help unclog pores and promote cell turnover. The included Green Tea Complex, Bisabolol & Vitamin C calm and sooth the skin while quenching free radicals. 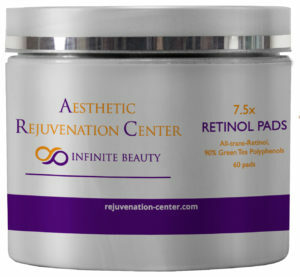 The skin care pads are easy to use and are free of alcohol, gluten, paraben, oil and fragrances. Our Infinite Beauty Eye Gel delivers the super hydration benefits of Hyaluronic Acid and is fortified with Liposome encapsulated antioxidants which smooth and plump the skin. The product is gluten, paraben, oil & fragrance free and will not clog pores (non-comedogenic). Vitamin C Serum is a comprehensive skin care brightening system which contains a penetrating Ascorbate blend of Arbutin, Emblica, Bearberry & Citrus Terpenes. It contains 20% Vitamin C active complex which supports healthy collagen production. The Bio-Compatible Antioxidant System (Emblica, Co-Q10, Vitamin E & Superoxide Dismutase) guards against free-radicals and moisturizes the skin. A controlled time-released delivery system maintains the potency and stability, allowing maximum penetration and absorption over time. The product is free of gluten, oil, fragrance, and paraben; and is non-irritating, hypoallergenic, and will not clog pores (non-comodegenic). 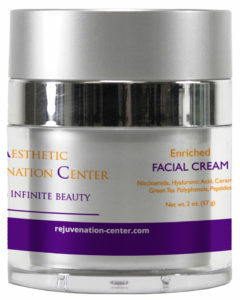 Our Clarifying Brightening Skin Polish is a mild & creamy gentle facial exfoliator with bio-friendly exfoliation beads. The Glocolic Acid, Salicylic Acid, Vitamin C, Green Tea Polyphenols, & Co-Q10 help to regulate oil, purify & minimize pores, enhance skin tone & texture, and reveal a fresh complexion. The product has a hypoallergenic fragrance and is free of gluten, paraben, oil, sulfates and is suitable for daily use on all skin types. Our skin protecting Recovery Ointment is formulated with the top pharmaceutical grade Petrolatum USP which facilitates healing and speeds recovery time when treating dry, cracked skin, minor abrasions, cuts, scrapes, and skin irritations. Ceramides assist in keeping moisture in the skin while Yucca Extract and Squalane help hydrate the skin barrier, soften the skin, and protect against dryness. Free from gluten, paraben and fragrance; this product is hypo-allergenic. Replenix All-trans-Retinol Smoothing Serum is a time-released, moisturizing therapeutic serum that helps to minimize visible signs of aging and achieve smoother, firmer, more evenly toned skin and reduce the appearance of age spots and pore size. Green Tea Polyphenols ensure minimal irritation and drying, while Hyaluronic Acid assists in skin hydration. Caffeine USP enhances overall antioxidant activity and helps diminish signs of redness. The product is gluten free and fragrance free and contains no paraben or oils. Daily sunscreen is an important part of your skin care routine. Our light weight Oil-Free Moisturizing Sunscreen contains a broad spectrum UVA and UVB SPF 30 coverage and is suitable for all skin types including acne prone patients. The product is gluten, oil, alcohol & fragrance free and is value-priced for daily use. Acne is caused when pores become blocked. There can be many reasons for this, from touching your face to pore clogging beauty products or even simply sweat. Even after eliminating the external causes of acne, some people will continue to experience outbreaks. Fortunately, there are options for getting your acne under control. Using professional grade products as a part of your daily cleansing routine is a great start. 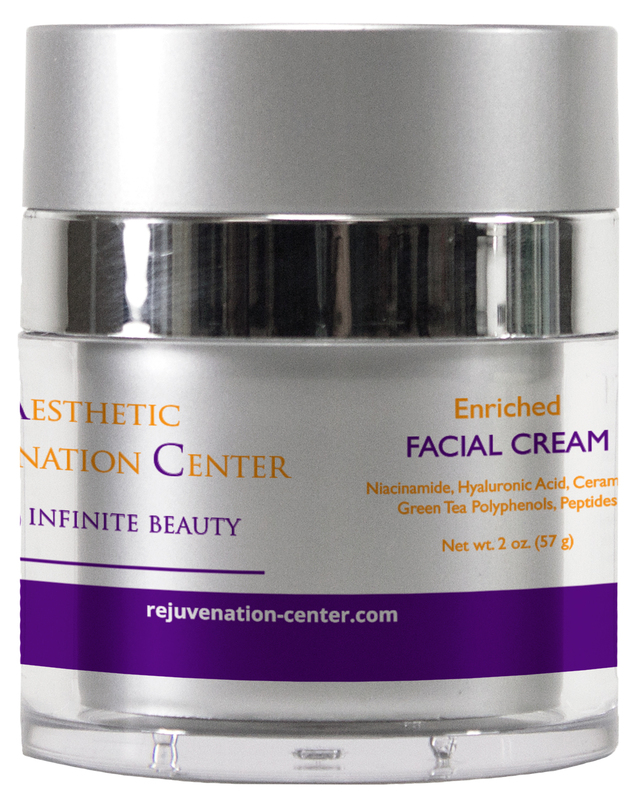 Aesthetic Rejuvenation Center addresses acne with professional and pharmaceutical grade products that meet your unique skin care needs. Our Glycolic/Salicylic Acid Acne Treatment Pads are formulated with the purest pharmaceutical grade Glycolic Acid available combined with pharmaceutical active acne fighting Salicylic Acid USP. 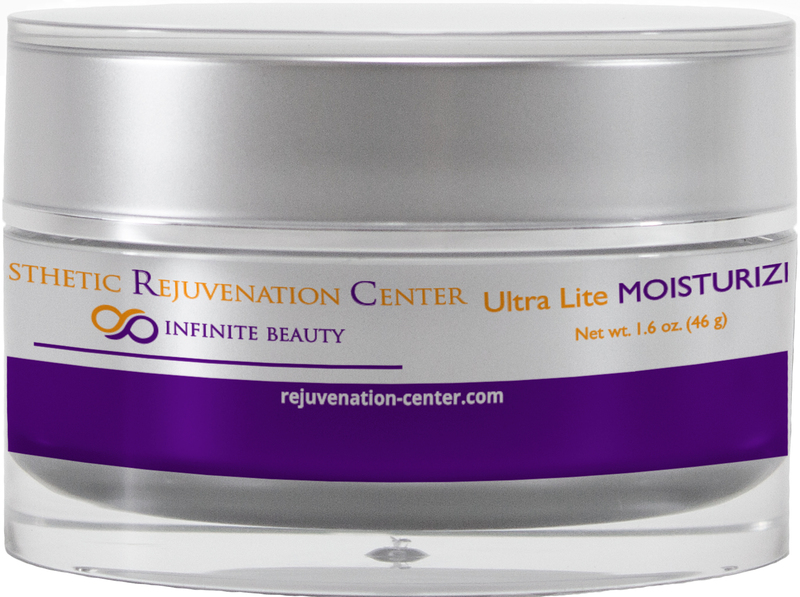 These products ensure minimal irritation, accelerate the removal of dead skin cells that can interfere with the proper oil drainage of the skin, remove surface oils, and unplug & refine pores. Witch Hazel helps reduce surface oils and refines pore size. The easy to “use and dispose” cleansing/toning pads are an excellent and affordable solution for pediatric and adolescent acne patients. The product is free of gluten, paraben, oil, sulfates, colorants and fragrance. Treating acne effectively requires daily cleansing with medical grade products. Our Benzoyl Peroxide Acne Treatment Wash & Gel is formulated with the highest medical grade Benzoyl Peroxide and is available in 5% or 10% solutions. The special soap-free cleanser & finely milled Benzoyl Peroxide thoroughly cleanse the skin and do not leave a white, chalky residue. Providing anti-bacterial protection against Propionibactrium acne (P. acnes), it serves as an excellent adjunct therapy to topical and oral antibiotics. Gluten, oil & fragrance free; the product is hypo-allergenic and will not clog pores.